On Sunday 3 February, the Charterhouse CCF shooting team had an extremely successful trip to Cambridge University for an away match, returning with an impressive winning score of 1491 to 1436. 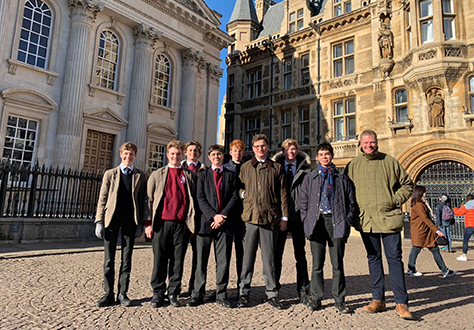 After the match, the team captain of the Cambridge University Rifle Association and Small-bore Club Rupert Fitzsimmons, kindly gave the team a whistle-stop tour of the University. The team are looking forward to competing against Cambridge again with Full-bore rifles at Bisley this summer. We offer our congratulations to all the boys who took part in the competition.